Hey Jude. Take a sad birthday and make it better. In a moment of weakness last night, I headed up to bed with a cup of tea and the October issue of Martha Stewart Living tucked under my arm, looking to find a few choice minutes of relaxation after the kids were asleep. It’s September, and I’m in the throes of back-to-school chaos. I’m especially vulnerable right now. Summer Kathleen is but a distant, sunburned memory, and Autumnal Kathleen is a God-awful mess — feeding her kids peanut-butter sandwiches at 4:30 before soccer practice and calling it dinner, forgetting to return calls and paperwork on a daily basis, not showering for days at a time, falling asleep mid-conversation with my husband, running at top speed from supermarket to mall to post office to dry cleaners to sporting-goods store to vet’s office to pediatrician’s office to pharmacy to Staples and back, and yet — somehow — not crossing enough off the to-do list. I think you can paint yourself a vivid picture, yes? I think many of you are intimately familiar with the same spokes of said gerbil wheel, n’est-ce pas? This was an egregious error on my part. Self-sabotage, if you will. Martha Stewart doesn’t make anyone feel relaxed. Ever. She’s funny that way. No, I’m not serious. What are you, simple? Oh, but how I kept on reading — about how the party was held at Jean-Georges Vongerichten’s restaurant, Perry St (decidedly laid-back, yet just a smidge more exclusive than your local Chuck E. Cheese), and that the guest list included such luminaries as “Jude’s first photographer” (ummm, my kid’s first photographer was her father, right after she got weighed on the maternity ward scale, and got all that scary, white, Schmoo-like goop wiped off of her). 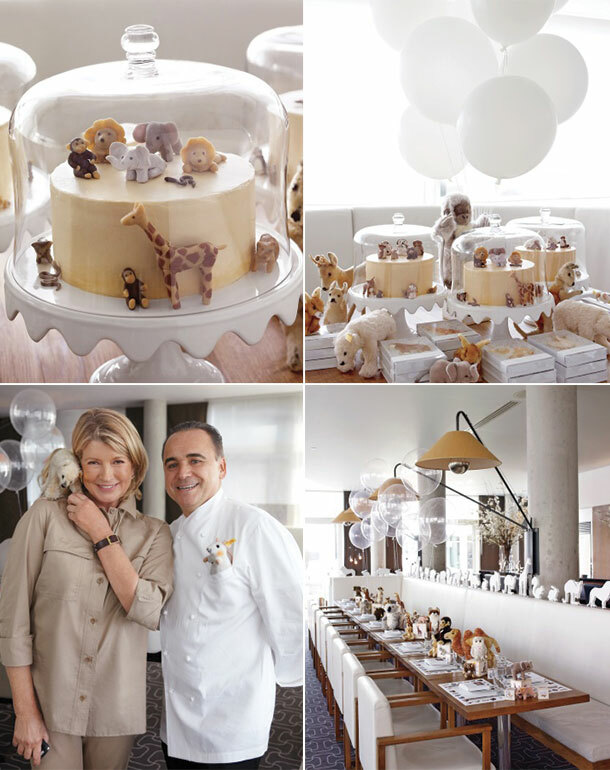 I learned that the whimsical balloon centerpieces at the affair were white and — wait for it — CLEAR, and that the color scheme for this poor, poor child’s first birthday party was taupe. Motherfucking TAUPE. Because a “festive but unobtrusive” touch was desired for the party table. Have you ever been to a first birthday party? They’re all obtrusive! I also read that there was only one other child in attendance at the party, equally leaden in spirit, given the lack of stimulating, eye-catching decor. Would you like to hear the menu? Oh, wait ’til you get a load of this. Sit down a minute. In fact, go get a drink. I’ll wait. The one year-old enjoyed butternut squash soup with Mimolette cheese and pumpkin seeds, followed by asparagus with mesclun, enoki mushrooms, avocado, and black-truffle vinaigrette. I don’t know about you, but when my kids were toddlers, I couldn’t keep enough enoki mushrooms in the house! I packed those snack cups full of friggin’ enoki mushrooms and they were empty by the end of library storytime. Every damn time. Makes me think of that ol’ TV commercial — “More enoki mushrooms, Mom! PLEASE?” Am I right or am I wrong, mommas? Hah? Hah? Also — the mother of the fêted child wore beige satin. That basically means she’s not feeding — or sitting anywhere within grubby, chubby-fisted reach — of the birthday girl. What did the nanny wear? I’d like to know. Because that’s who fed the poor kid the birthday cake, and she’s covered head to toe in greasy smears of friggin’ marzipan. She’s wearing Hefty garbage bags cut on the bias. No question. Hey, ummm, Jude? I’d like to tell you to take a sad, sad first birthday and make it better. But I can’t. You’re Martha Stewart’s grandchild. You’re totally screwed. I hope it’s a good life, Jude — even if it’s one that only allows hand-painted wooden toys, duchess satin bows, and vintage chenille bedspreads — which you won’t ever be allowed to lounge upon and daydream on. I weep for your efforts at pumpkin-carving next year. Handmade Christmas ornaments? That’s going to be six months of therapy for you right there, Judey-Judey. Sure, you’ll be enjoying the rugged, desolate coast of Maine — a lot, since GrandMaMa will be flying you up there often enough on the ol’ family helicopter — and I bet you’ll be riding those Friesians as often as your little taupe heart desires. In a few years, what I bet you wouldn’t give for a plain old peanut-butter sandwich before soccer practice, Judey-Judey. I mean a real, honest-to-goodness pb — one without fig preserves, spread on fresh-baked ciabatta, hand-cut with a paring knife and craft scissors into the likenesses of Mount Rushmore’s handsomely chiseled presidents. We all have our crosses to bear, Jude. Yours will be made of agarwood, inlaid in hand-whittled chips of smoke tree burl with Latin phrases of war, but it will be yours to carry, sweet, sweet, sorry child. Oh poor Jude. But lucky for us… I love getting a good laugh first thing in the morning! But YOU, my dear, are much funnier than Martha! This one made me laugh out loud. Thanks for the smiles.